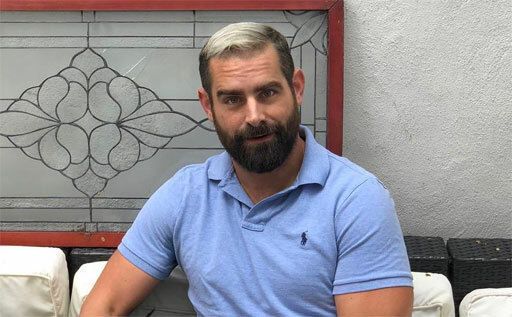 The Randy Report: Brian Sims Calls Out GOP Lawmaker "Stop Lying. It's Gross." Brian Sims Calls Out GOP Lawmaker "Stop Lying. It's Gross." Woofy Brian Sims of Pennsylvania does not suffer fools gladly. It all began when Marsha Blackburn, the Tennessee Republican who was recently elected to the U.S. Senate, took to Twitter to blame Democrats for the shutdown of several federal departments and agencies. "I am disappointed to see that the Senate Democrats chose to shut down our government instead of secure our southern border," wrote Blackburn on Saturday. "The American people deserve to be protected against drug cartels and human traffickers." As has been widely reported, the current government shutdown occurred because Donald Trump reneged on an agreed upon bipartisan plan to fund the government until February. In a meeting ten days before the shutdown, Trump even told Democratic leaders Rep. Nancy Pelosi and Sen. Chuck Schumer that he would be “proud” to shut down the government. Sims, the hunky gay Democratic state lawmaker in Pennsylvania, called out Blackburn on Twitter for her "outright lie." "Marsha, all spin aside, this post is just an outright lie," Sims clarified on Twitter. "It’s no a play on what really happened. It’s a complete fabrication. This is the kind of bold-faced lie that makes people hate politics and politicians. From one elected official to another: Stop Lying. It’s gross." Marsha, all spin aside, this post is just an outright lie. It’s no a play on what really happened. It’s a complete fabrication. This is the kind of bold-faced lie that makes people hate politics and politicians. From one elected official to another: Stop Lying. It’s gross. Blackburn, who has been a Trump toadie for a long time, was merely repeating what her idol has been tweeting since the funding debacle bubbled up last week. According to The New York Times, the Trump shutdown will likely last into the new year when a new Congress is sworn in and the Democrats take control of the House. The shutdown has shuttered the Departments of Homeland Security, Justice, Interior, Agriculture, Housing and more. Some 400,000 federal workers are expected to be furloughed as we head into Christmas. My man Brian has never shied away from calling out GOP politicians for lying. When anti-LGBTQ Vice President Mike Pence was heading into Philadelphia (Sims’ district) for a visit this past June, Sims ‘welcomed’ the veep with a controversial image giving Pence the finger. I've been a fan of the woofy Sims for years. Let’s take a stroll through his Instagram, shall we? Just want to send a big Thank You to #outmagazine for making me one of the OUT 100s .... You Guys Rock !